De Burg Burger (formerly known as Sunshine @ Carries Cafe) used to be located in a condominium at Farrer Drive. It recently shifted operations to a coffee shop at Ghim Moh (Updated: Bukit Merah). My hunt for the best burger in Singapore led me to De Burg after two of my friends told me that they had very good burgers here. A new western stall in coffee shop that has good burger? I was not convinced. It sounded very Botak Jones-ish to me. But when another friend subsequently tweeted that De Burg (the name of the new burger place) has the best burger in Singapore, I reckoned that there is no harm giving it a try. De Burg has around 13-14 burgers on the menu (choose from 100g or 200g patty) and some of them are: Crab Burger (Blue Swimmer Crab Claw Meat), Pork Burger (Grilled Aus Pork patty), Mexican Burger (Grilled Aus Beef Patty with Salsa), lamb burger with Nutella, and a beef burger with Wagyu patty. The highlight of the burger menu is definitely the $25 De Burg Decadence. Grilled Aus wagyu patty with cheese, bacon and portobello mushroom, it is only available on Friday, Saturday, Sunday and Public Holidays. Again, it is the debate on how much are you willing to pay for Western food in a coffee shop. Tomatoes have many benefits and it has become a fixture on my daily routine. So I was happy to see that the Pork Burger ($8.45 for 100g/$12.95 for 100g) from De Burg had a slice of tomato, and lots of greens alongside the tender and juicy pork patty. A very decent burger if you do not take beef. With a 150g of chicken thigh patty, the Chicken Burger ($8.95) had an interesting twist in the form of the salted egg yolk sauce. I guess I am biased with anything-salted-egg-yoke, but the burger was actually pretty good. It could be better if there was more sauce though. If you are an vegetarian, De Burg’s Portobello burger (6.95) is definitely the one to go for. Otherwise, we thought that the burger was pretty run-of-the-mill; the portobello mushroom was burnt, there was nothing fanciful about the vegetarian burger. Okay maybe it is just me, but I find it hard to accept a burger without meat. Apparently there is a vegetarian burger restaurant at Eunos, VeganBurg that serves tasty burgers without meat. I shall try that next! There are a few variations of the beef burger on De Burg’s menu. 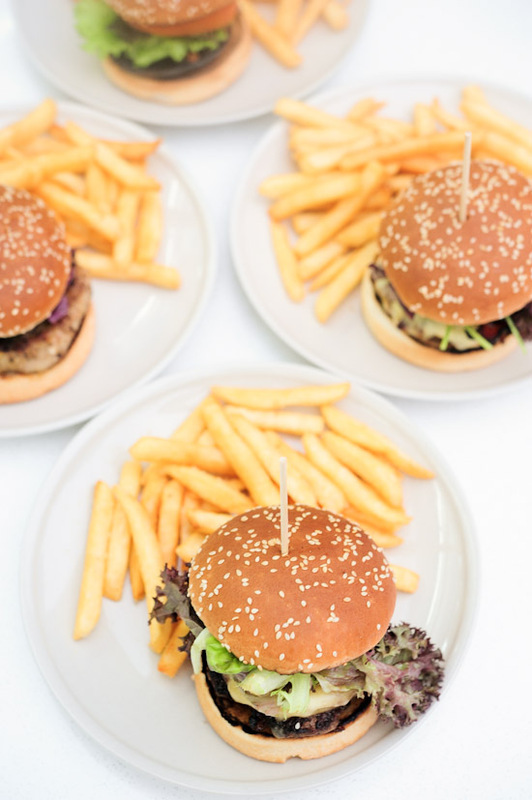 From the default Plain Beef Burger, to Blackpepper burger, and Mexican Burger, all of them use the same Grilled Aus Beef patty with different ingredients and sauces. We had the Hawailian Burger ($8.45 for 100g/$12.95 for 200g) which came with a Grilled Aus Beef patty, cheese and pineapple. The patty was slightly dry and on hindsight, we should have gone for the 200g patty instead. De Burg’s beef burger was good, but I wouldn’t call this the best burger in Singapore. De Burg has pretty good burgers and most of them are priced reasonably between $8 for the 100g patty and $12 for 200g patty. Their tag-line is “Burgers are not fast food”, and I agree that good burgers are definitely not junk food. If you are in the Buona Vista/Holland Village area, do drop by De Burg and try some of their burgers. Note: They have since shifted to Bukit Merah, the stall at Ghim Moh Road is no longer in operation. Rice burgers are my favorite really. just visited: you can’t call yourself a burger place while you still use mcdonalds buns – sugary soft balls of puff. when they fix this, then they can start talking about trying to make a proper burger. sorry if that’s a bit bitchy, but come on, this is the second decade of the new millennium. time to get with the program. I’m sorry, I disagree with tk – what is a burger place with really good buns, and sub standard meat and ingredients in between? I’ve had more than a few burgers (high end fancy smancy to our malaysian cousin Ramly) and while the bun is key, as long as it holds its shape while the goodness of the patty ozes it passes mustard with me. What the point of having a great artisan bun if its not grilled on the griddle? Deburg’s got it right – you can see and taste the slightly charred flavor of the bun, and some of that grease, which again is the key ingredient. There are places out there with first class ‘buns’ – but they toast they bread separately before putting the burger together – i mean really? tk might forget that the best burgers (try the shake shack in nyc, or in and out in cali) keep it really simple – and at the end of the day it all comes together. My personal mantra is that if you love a ramly, then you are a real burger lover, and if you then are, then you’ll love deburgs – nuff said. You can change the address to CT Hub in Kallang now.